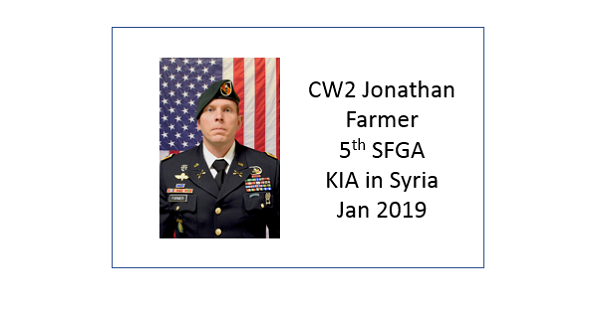 ​Chief Warrant Officer 2 Jonathan Farmer, age 37, of Boynton Beach, Florida died of wounds sustained during an attack while conducting a local engagement in Manbij, Syria, January 16, 2019. Born April 27, 1981, Farmer joined the U.S. Army on March 30, 2005. He attended One Station Unit Training at Fort Benning, Georgia in 2005 followed by the Special Forces Qualification Course. He graduated in 2007 as a Special Forces Engineer Sergeant and was assigned to the 5th Special Forces Group (Airborne) based at Fort Campbell, Kentucky. Farmer earned his commission as a Special Forces Warrant Officer in 2016. Following graduation for the basic Special Forces Warrant Officer Course, he was selected to serve as an Assistant Detachment Commander. Jonathan Farmer was born in Boynton Beach, Florida. For part of his childhood he lived in Laconia, New Hampshire. He played on the high school’s baseball and basketball teams and completed his sophomore year before moving to Florida in 1997. January 25, 2019. “Jonathan R. Farmer ’03 among Americans killed in Syria”, The Bowdoin Orient. January 24, 2019, “Fort Campbell Green Beret was loved for his fighting spirit and giant hugs”, Leaf Chronicle. January 18, 2019, “Syria Bombing Victims Identified”, SOF News. January 18, 2019. “Jonathan R. Farmer ’03 (1982-2019)”, Bowdoin College. January 18, 2019. “Former Laconia High School student killed in Syria”, The Laconia Daily Sun. January 18, 2019. “Former N.H. Resident and Bowdoin College Grad Among Four Americans Killed in Syria Terror Blast”, The Boston Globe. January 18, 2019, “DoD Identifies Three Operation Inherent Resolve Casualties”, Department of Defense. January 16, 2019. “Explosion Kills Four in Manbij”, CENTCOM. Photo: DoD. Biography provided by United States Army Special Operations Command (USASOC), Fort Bragg, North Carolina.